A man for the ages . . . .
On a recent return trip from Colorado, I decided to pull over at the visitors’ center on I-80 between Laramie and Cheyenne. I had two young passengers who I believed would enjoy seeing this magnificent sculpture of Abraham Lincoln, perhaps our greatest president since George Washington. Surely this would be a more educational experience than seeing the latest Hollywood flick “Abraham Lincoln, Vampire Killer!” Enough said about that. 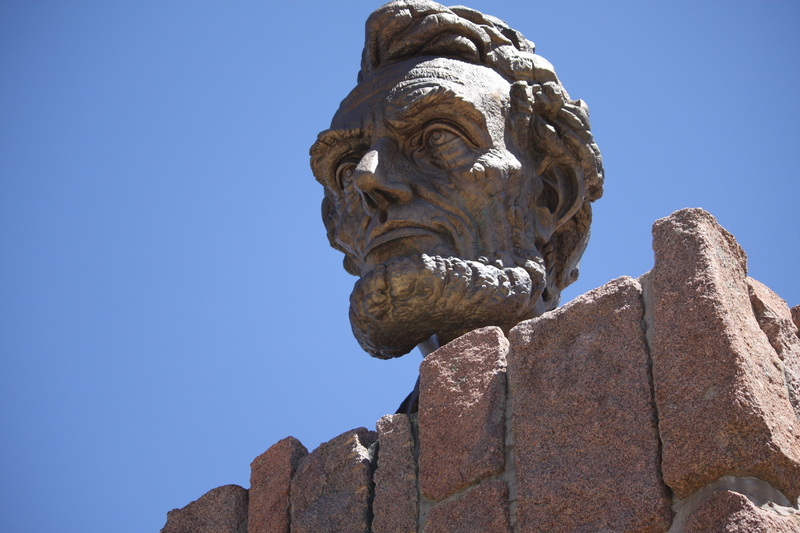 Sculpted by Robert Russin, a former University of Wyoming professor, this great bust of Lincoln is also replicated at Gettysburg. I had the privilege of owning and residing in Robert Russin’s former home in Laramie, and could not help but wonder at the time how he could have sculpted this massive creation in the studio he built behind his house. Obviously, the rendering of his model was cast much larger than the original! Placed on a site near the crossing of the first transcontinental USA highway (appropriately named the Lincoln Highway), this sculpture dominates the hillside where it stands overlooking I-80. The old Lincoln Highway passed over the crest of the hill seen behind the monument. This was the historic “Summit,” the highest point on the original highway’s 3,500-mile route from New York to San Francisco. This monument commemorates the sesquicentennial of Lincoln’s birth and was commissioned by the State of Wyoming in 1959. The brooding countenance of this Lincoln bust is almost as compelling as the Lincoln Memorial on the mall in Washington, D.C. And the story of his assassination, so aptly rendered in this year’s best selling book “Killing Lincoln,” makes one wonder how someone could have planned and executed such a terrible crime. It was a great loss for our country and the American people. A poem written by Walt Whitman upon Lincoln’s death brings tears, no matter how many times I have read it. It makes reference to the long journey by train returning Lincoln’s body to his home in Illinois.